Yeah, I know. I was here and then I wasn’t and you probably thought I gave up the garden and the barn and bought a townhome with a pool and an HOA that handles the lawncare. Don’t think I didn’t consider it after the fiasco that was this year’s sheep shearing. Otherwise known as Fleece-Mutilation-and-Samantha’s-Big-Escape. Not to mention the arrival of squash bugs in the garden in by the first week of May. Which makes me think they were flourishing on the feast of 1,000 baby preying mantises that I released in April. But the real reason for my radio silence was that I was preparing for our 3 week trip across the country in June. That included putting the final touches on my travel itinerary, stocking up on food for hotel room meals and hiking snacks, multiple visits to AAA, as well as preparing the barn for our absence. If you haven’t prepared a barn and all of its inhabitants for 3 weeks without the farmer, then you’re smarter than me consider yourself lucky. Very, very lucky. I started by cancelling kidding season and selling all of my diary does over the winter. Because it is impossible to prepare a barnful of pregnant and lactating does for a 3 week absence of the farmer. Impossible. Leaving them alone for 3 weeks is just begging for deformed kids, exploding udders, and traumatized barn sitters. It wouldn’t surprise me to come back to my dairy goats after 3 weeks and find the barn sitter curled in a corner, shaking uncontrollably, and muttering about how the goats turned into zombies and ate each other’s brains. That’s the kind of sh*t that can happen when the farmer leaves a barnful of dairy goats alone for 3 weeks. For real, people. For. Real. So I sold off the does and just kept a few bucks for breeding purposes. My next step was the spring shearing of the sheep. So I sheared, skirted and washed the fleece, carded it, and left it in rolags ready to spin when I got home. Just kidding! I sheared the sheep and carried those fleeces right down to the rose and azalea beds as mulch. Because I knew there was no way in h*ll that I had time for anything else. Plus, I already have a shelf full of fleece that hasn’t been washed or carded yet. Plus, I had to spend hours chasing down Samantha after she escaped. Plus, I had to spray the sheep down with Blu-Kote everyday to clean the bloody wounds I left behind after I rushed through shearing with dull shears. There’s an entire post waiting to be written about this year’s sheep shearing. When I can bear to think about it again. With the sheep tortured into submission taken care of, I hauled Bruno and Bella, the livestock guardians, off to the vet for their annual check up and summer flea and tick medications. Of course, Bruno showed signs of arthritis and needed to start on glucosamine chondroitin pills. Because it’s easy enough to convince a barn sitter that the 115 lb Great Pyr won’t attack her when she comes in to feed the livestock every day as long as she stays calm and confident. It’s even easier to convince her to go ahead and just pry open his jaws and drop in a pill every morning. It was a decent attempt by Bruno to foil my travel plans, but since the barn sitters were already going to have to turn the shock collar for his invisible fence every day to keep the prongs from digging in, I figured they could handle the pill-popping at the same time. And then they could lock all the fence chains and variety of barriers that we use to keep Bruno contained in the pastures, off the road, and out of the nest boxes in the chicken coop. Nothing makes your farm operation look more professional than explaining the series of booby traps used to keep the livestock guardian from going on walkabout. Once the dogs were as prepared as possible, I moved onto the goat bucks. All of them got a hoof trim and a sprinkle of DE for mites and fleas. I freshened their minerals and baking soda to prevent any bloating because they were sure to get into something inedible and eat it while we were gone. Then I set up a large hay rack out of a cattle panel and Pretty helped me haul several tarp loads of hay, filling it to the brim. Usually I just carry a pitchfork of hay from the big barn to the bucks each morning. That keeps the hay fresh and stops the chickens from nesting in it, but I wanted to simplify the chores for the barn sitter. And I figured any nesting hens would produce chicks to replace the ones I was about to release from the back room of the barn. The Silkie hen and her chicks had been coddled for a few weeks with crumbles and their own chick waterer and protection from the rest of the flock. But I shooed them out and sighed as one of the chicks promptly stranded itself in the crack of an old pallet. The odds were against those biddies being alive when I got back. So a broody hen in the buck hay wasn’t necessarily a bad thing. I needed that back room with its feeder and waterer for the turkey. The turkey is unpredictable with me and aggressive with strangers. First, I tried to sell him so I wouldn’t have to deal with him anymore, but there were no takers. My second plan was to catch him, wring his neck, and throw him into the woods for the local coyote population. Taking the time to butcher him and put up the meat before we left ranked right up there with washing and carding fleece. I settled for middle ground and tossed him into confinement in the back room of the barn. With a full bucket of feed and water, someone just needed to check on him every few days. He would have sunshine, shade, a roost, and plenty of time to think about the transgressions that got him into that room. And the barn sitters would get to keep their eyes. There was still more to do—extra cans of feed carried out and filled up with extra bags of grain, leaks in hoses fixed, hay rolls bought and rolled in, water buckets scrubbed free of algae, coop cleaned, etc, etc, etc. That’s not including the garden which got staked and pruned and and weeded and mulched and a slew of soaker bottles. 2 days before we left I put the mower on its lowest setting and trimmed every blade of grass I could find. In the process I kicked up a rock into my left eyeball and had to fit in an emergency trip to the eye doctor. She removed a shard of rock and gave me pain drops and an antibiotic for the abrasions to my cornea. As well as a lecture on putting the mower on the lowest setting and not wearing eye protection. The night before we left, Luna came in from the backyard, limping on her left front leg. I checked for snake bites and, not finding any, gave her an aspirin and informed her firmly that we were going on vacation for 3 weeks. And none of this nonsense was going to stop us. She folded and her limp was gone by the time we were up and pulling out of the driveway at 6:30 am the next morning. So I didn’t have time to write any blog posts in May or June. I promise to write some flashback posts to the oh-so-enjoyable period of time before we left. And I already have stories to tell you about what has happened in the barn and garden in the 3 days since we got home. But, believe it or not, this post is not about the farm and the garden. It’s about America. And the trip we took to see it. Any parent will tell you that kids start asking for the snacks when they are only 1.3 minutes into a road trip. Which is odd. Because how does a child get so hungry after simply climbing into the car, sitting in the seat, and staring out the window for 1.3 minutes? However, I have never had a child get so hungry in the first few minutes that he wanted to eat the air freshener. It was our first laugh on the road and an epic beginning to an epic road trip. So we can thank Little for getting us off to a good start and we managed to keep him from eating anything until we were having Goober Grape sandwiches at our first stop—-Beckley, West Virginia. Of course,we had no idea that these communities in West Virginia would be so drastically affected by flooding just a week after our visit. We stopped at the Exhibition Coal Mine in Beckley to tour the Phillips-Sprague coal mine and see the craggy hills and mountains where the miners scratched out a living. We had watched The Mine Wars and The 33 before our trip. 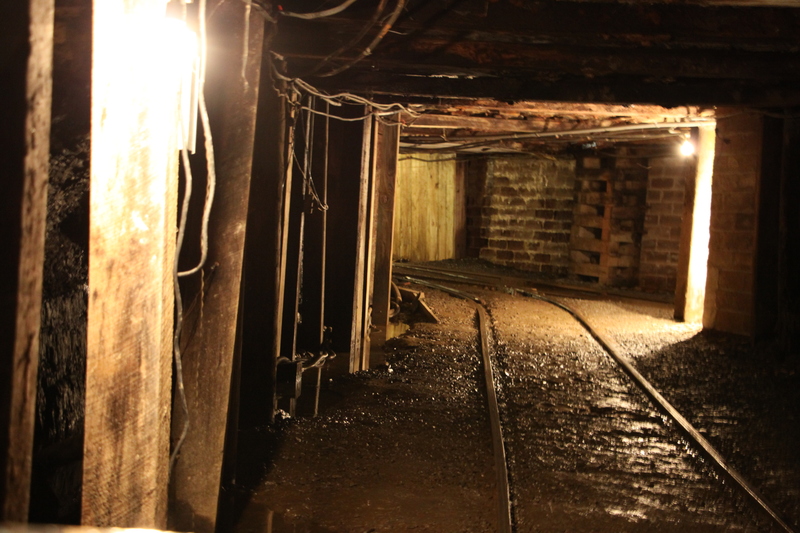 But nothing prepared us for a ride through the dark, wet tunnels where men spent 10-12 hours a day. And some still do. We walked through the reconstructed mining town where the buildings were set into the hillside and the only thing that kept miners and their families out of the mud was the endless zigzagging boardwalk. When we heard about the flooding, it was suddenly easy to imagine the torrents of water washing through those cuts in the mountains and carrying the towns with it. And frightening to realize that people were still as susceptible to those dangers now as they were back then. That, then, is one of the benefits of travel—-it changes a person’s perspective. What seems foreign and distant one minute becomes familiar and relatable the next. We also discovered a discouraging truth that would plague us the rest of the trip. People have absolutely no smartphone etiquette. I mean, really, smartphone users are almost unbearable in public. In an attempt to show us how dark the mines were without the artificial lighting used during the tours, the guide turned off the electricity and lit a carbide lamp that the miners used while working underground. It took ages to get the full experience because every moron with a cell phone kept lighting up the space with their screens or text alerts or power buttons. For years I have insisted that technology has made people stupid and dependent. I would now like to add that technology makes people obnoxious tourists. Before we left West Virginia we drove to Charleston to see the capitol building. It was the first of many capitol domes we would see, sometimes up close and sometimes in passing on the road. 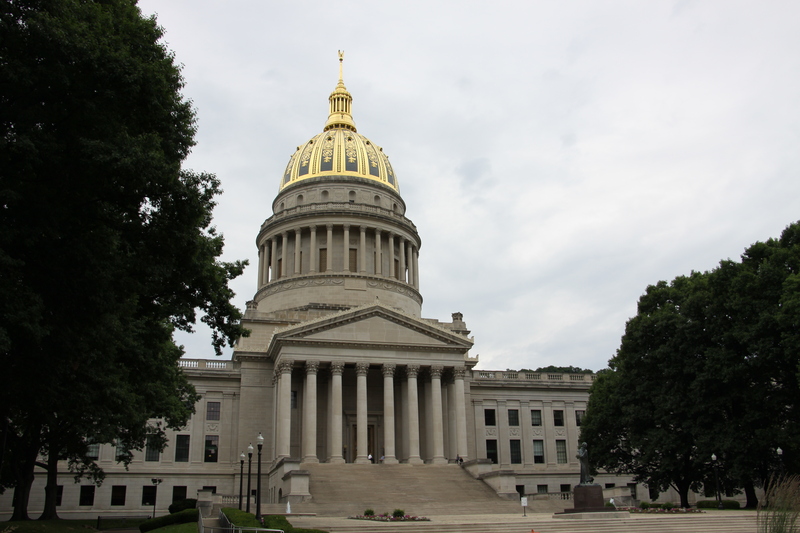 Almost every city’s capitol district sported a domed building, although Charleston had some impressive gold leaf. It also had an impressive river walk along the Kanawha River. Lovely sidewalks, pretty landscaping, and a view of mansions on the other side of the river. Too bad it was deserted. Like a lot of downtown areas, Charleston seemed to have trouble retaining citizens after the fancy government buildings closed and the workers went home at night. We had vowed not to buy food from a single fast food chain during our trip so we wandered the mix of local diners and renovated apartments stuck between dilapidated buildings and check cashing services around the capitol. We settled for Starlings Coffee and Provisions which sold me a delightful latte that carried me just fine on through to Kentucky. 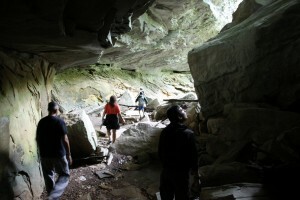 We made the Carter Caves in Kentucky just in time for the last tour of the day in the X-cave. The caves were not a planned stop but one of the many “in case of” venues that I stuck in my itinerary. These were places we could easily bypass if we were pushed for time but made good fillers if we were ahead of schedule. It won’t surprise you to learn that these “fillers” ended up being some of the best stops on the trip. Life is like that. The universe loves spontaneity and these places were as close to spontaneity as it gets when you are traveling with a Type A control freak. A brief hike through the woods while waiting for our tour reveled that the area was filled with natural caves and rock formations, ripe for exploring and letting kids scramble around after hours in the car. There were deer and birds and crayfish in the creek. Wooden bridges, babbling streams, and shady forest paths. Inside the cave there were impressive cave formations and we learned tips for distinguishing stalagmites from stalactites and how long it takes for them to form as well as traversing the wet side and then the dry side of the cave where the wind and water flowed in opposite directions. We also experienced the absolute darkness inside a cave. (You know, absolute darkness except for the light from the idiots with smartphones.) And we had our second really hard laugh of the trip from the tour guide. Once all lights were finally extinguished and we settled into the darkness, she asked how many of us thought we saw shapes or shadows. Then she explained that we weren’t really “seeing” anything but that in the total absence of light our brain tries to fill in the vision gap by summoning memory of what we saw last. Those memories are extremely fallible and can result in wandering around in the cave aimlessly despite thinking you know where you’re going. Then she told us to take one hand with our thumb on our nose and wiggle our other fingers wildly and see if we saw any difference in the darkness. Of course, she flipped the light switch back on and caught most of us with a hand on our face, fingers wiggling like crazy as if that would someone make us see better in the dark. Score one for the tour guides! We made our way to Louisville and crashed for the night. And I didn’t even bother to call and see if the barn animals were doing OK. Because, honestly, I plan to pawn off that goat zombie apocalypse as starting on someone else’s farm. I actually love looking at others vacation photos. Looking forward to part 2! I wondered where you were. I’ve been waiting for this for weeks. Can’t wait to vicariously join you on the rest of the trip. Totally understand the “barn prep” experience and the helping someone else get started with “zombie” goats. Glad your trip was a good memorable experience. Look forward to hearing about the rest of it. I wish we could do the trip you all have done and maybe Roger and I WILL be able to in the Fall – once he is more fully recovered and can do some of the driving. Meanwhile, keep the travelogues coming…secondhand travel is good, too! Wow. I thought we had a hard time getting out of town. Glad we don’t have a barn. Can’t wait to hear the rest!